Starting next year, Mrs. Tuholski is going to be parting ways with LPHS and taking on the new intermediate school. Tuholski will be teaching agriculture, looking to bridge the gap our food takes from the farm to the table. She hopes to incorporate many components of farming into her agriculture class. A huge goal of hers is to plant a garden and a greenhouse at the intermediate school. Tuholski would like this area to have an availability to reach outside of her class. It would be an excellent resource for not only her agriculture classes, but for anyone wanting to enjoy the garden as well. “The nutrition classes could use the greenhouse to bring fresh produce into the meals that we create. The science classes could also use the greenhouse to do experiments or create hydroponic units,” Tuholski said. The uses of a school greenhouse or garden are endless! There are so many opportunities for collaboration and cross-curricular lesson plans within the community. Tuholski carries high hopes for her students to get involved in knowing more about where their food comes from. She plans to start by getting local foods into the cafeteria. It is important for students to be aware of where their food is grown and how they can get access to it. Tuholski has already made an impact in teaching her students all about the food system. The focus of her nutrition classes at LPHS is how food is grown and how it gets from the farm to the plate, along with involving them in local food. An example of Tuholski connecting her students with local food is the Pennie Purdue Agriculture Center in Wanatah. Tuholski contacted this program, and they donated pie pumpkins for her students to use in class. They were able to make pies and even roast the seeds in the pumpkins using the donated local produce. “This is a great example of a farm to table experience,” Tuholski said. Though Tuholski is moving to a different school, she has hopes in future collaboration with the intermediate school and LPHS agriculture programs. 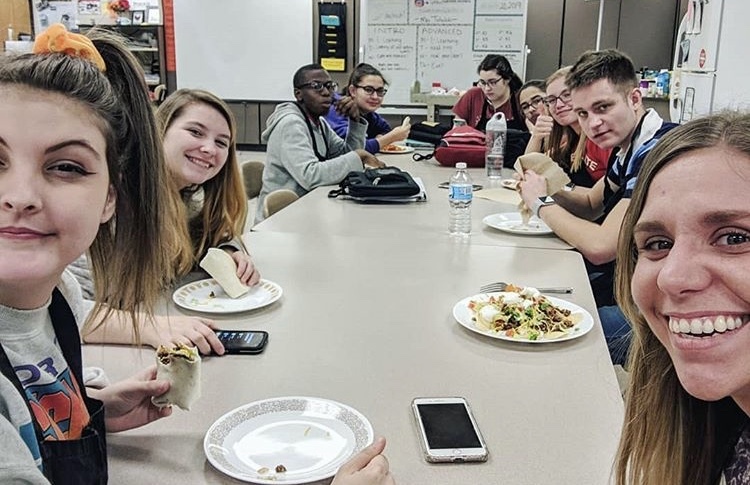 “I am really excited to collaborate with the high school on projects and to connect the two programs,” Tuholski said.